← (Nearly) Live at Social Media Week: Has Technology Changed Everything? It was 18 years ago in 1872 that Ulysses S. Grant signed the bill creating Yellowstone National Park. And it was at the same time that the Helena Daily Herald christened this massive expanse of one-of-a-kind natural oddities Wonderland. Depending on who you talk to, the creation of Yellowstone as a national park was intended to preserve this scenic Wonderland for all Americans, to protect it from commercial exploitation and to act as a reservation for the park’s wildlife, including buffalo, bears, elk and antelope. But others say the idea came from Jay Cooke as a way to load the potential visitors onto his Northern Pacific Railway. Whatever the reason, Yellowstone exists today at the edge of wilderness and civilization, a place that can still be discovered and explored. It presents a collection of natural wonders that can be seen nowhere else in the world. There is the scenic beauty of stops like the Yellowstone Grand Canyon but there is also an unending array of geysers, springs, and boiling mud pots, many in striking colors and surrounded by unusual rock formations. Sights like these, as you might imagine, are unpredictable. 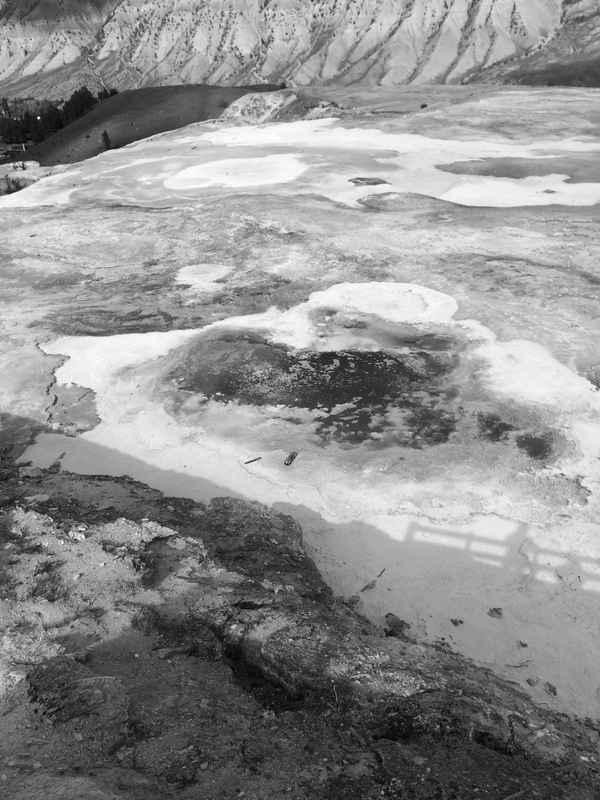 One of Yellowstone’s geysers goes off only once every fortnight. Old Faithful, on the other hand, got its name by being just that and putting on a show on a regular schedule for all visitors. A trip to Yellowstone is both vigorous and invigorating. If you are coming from the east coast the most popular route is to take the Northern Pacific to Livingston, Mont., and to change there for a spur route to Cinnabar, Mont. At Cinnabar you can board a stage coach for the 8-mile ride through the northern entrance of the park to the Mammoth Hot Springs Hotel. If you’re coming from the West you can take the Utah and Northern Railway to Monida, Mont., then take a stage coach through the West entrance. 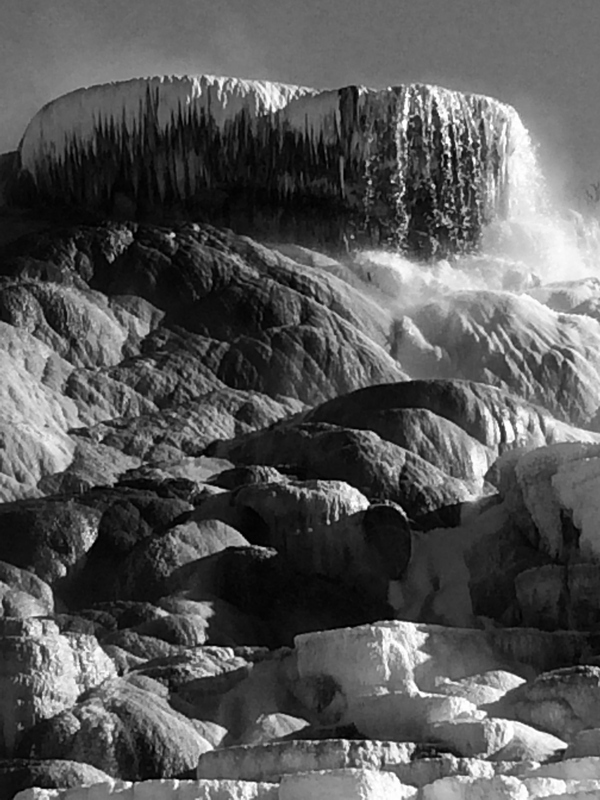 At the Mammoth Hot Springs Hotel you can book 5 days of lodging, meals and transport through the park for $40. Travelling within the park is on horse-drawn wagons, each with four horses and capacity for 11 passengers. Some visitors will rent a wagon and camping equipment in Montana and explore the park at their own pace, often with guides and servants. Others choose to explore on horseback. The Northern Pacific publishes the Wonderland guides which include information about Yellowstone’s attractions and maps. In addition to the famous Mammoth Hot Springs Hotel, a new hotel, the Lake, recently opened near Yellowstone Lake. And the soon-to-be Fountain Hotel is under construction near Old Faithful. For the campers there are tent camps at the Norris Geyser Basin and the Upper Geyser Basin. President Chester Arthur choose to camp on his tour of Yellowstone in 1883. Yellowstone is a vast territory and many of the attractions are quite far apart. It is more than 30 miles from the Mammoth Hot Springs to Yellowstone Canyon and almost 40 miles to Old Faithful. Coach tours of the park may cover as much as 40 miles a day. In the last decade, the Army Corps of Engineers has built some new roads and made getting around the park a bit easier. Since 1886, Yellowstone has been managed and maintained by the U.S. Army. While many come to Wonderland to see the sights, others see it as a path for restoring physical and mental health. One well-known German doctor prescribes its spring water, because of its arsenic content, as an effective treatment for nervous disorders. Others cite the healthfulness of the sulphuric smell that pervades much of the park. And of course we all understand the restorative value of camping. At this early stage of its existence as a national park, Yellowstone remains an adventure, a way for travelers to imagine themselves on a Lewis and Clark expedition. It is a place to feel free and explore. 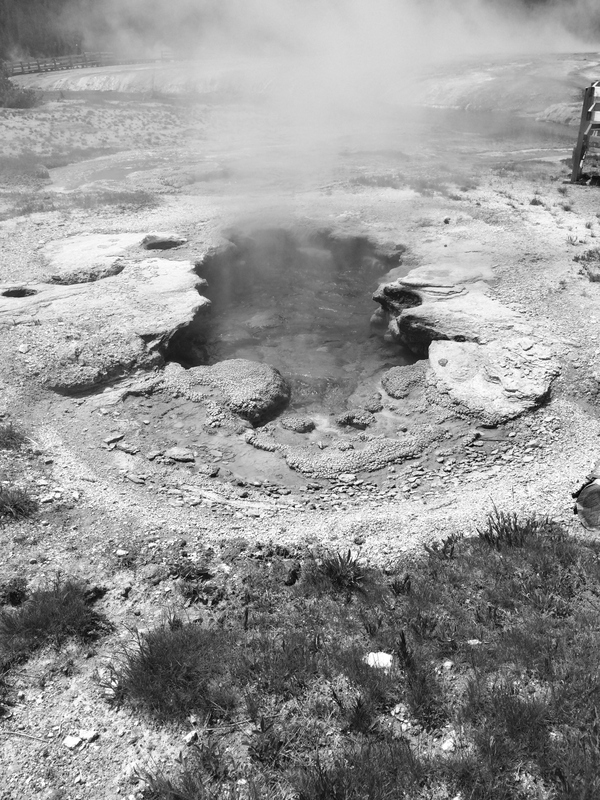 This entry was posted in 1890 Travel Blogger, History, Travel and tagged 19th century, geysers, history, national parks, Old Faithful, railroads, travel, Yellowstone. Bookmark the permalink. Oh to go back in time to see the Wonderland! I wonder – were we more thoughtful about the environment or did we just have less to trash it with? Were we more grateful for making the long trip safe and sound or do we think less about being grateful for how far are travel ability has advanced. 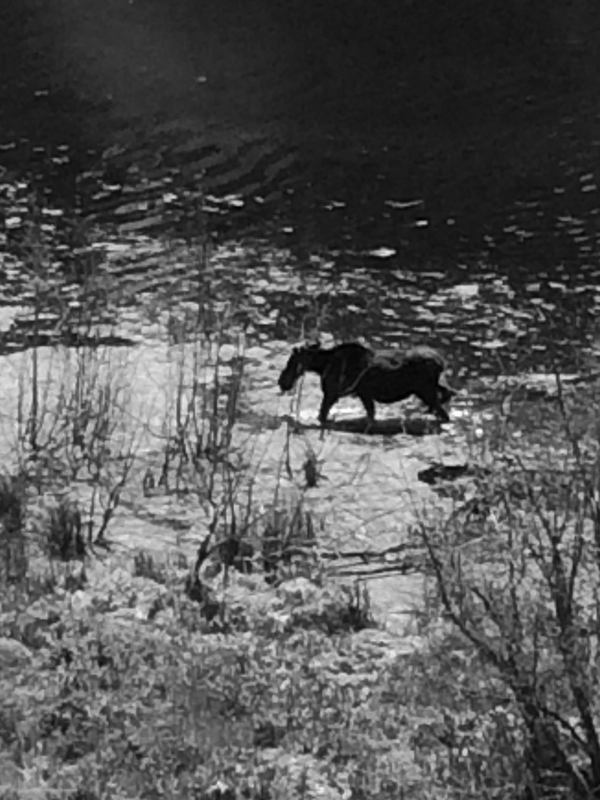 Ken, aren’t we fortunate that people had the foresight to designate certain areas as National Parks where we can still see a moose or a bear (not that I’d want to get to close) but just the idea that this still exists is wonderful. I do wonder though about people exploring the Park on horseback, didn’t they ever run into problems doing that. Not much protection there. Yellowstone is such a remarkable place. I’ve never seen it in black and white! Thanks for posting those pics, Ken, and for your informative post. I’ve never been to Yellowstone so I was interesting to experience it from an 1890s perspective. I love that you used to be able to plan an entire vacation for $40 (which surely was a lot of money). I’m one of probably the few people in this day and age who has traveled to somewhat far away vacation destinations by train. It is fun to think that is how everyone traveled in those days. I love traveling by train but have never taken a really long trip. Usually just New York to Washington or Boston. Beautiful photos Ken. Visiting Yellowstone National Park is a dream of mine because of what an iconic landmark it is. I had no idea the park stretched so many miles! i’m sure every step along the way is truly memorable. I was there in the Spring and was staying near Jackson, Wyo. I entered the park from there and kept going from one thing to the next. By the time the day was done I was shocked to realize I was in Montana and more than 3 hours away from my hotel. Must be bigger than some of the smaller states. A brilliant post. What a creative idea to write this as a historical travel piece. 5 days of lodging, meals and transport through the park for $40! According to an inflation calculator, $40 of 1890 dollars would be worth: $1,052.63 in 2014. Interesting stuff! At $1,000 for 5 days that’s still a pretty good bargain. What a cool and creative way to write the post! For a second there I forgot and that the hotel was still $40 a night and thought Where do I sign up?! Lol. Love the black and white pictures too. It would have been fun to visit and tour Yellowstone as they did back then. Like your way of approaching bloging from a historic perspective. If I’m not mistaken I visited Yellowstone national park when I was nineteen. Great photos. Can’t help wondering what the place looked like in the 1890s. Very cool perspective Ken. Brings up all sorts of questions including the one in my head now about time travel 🙂 I would love to spend $40 and see the park in its youth. What a unique look into Yellowstone! Although I have to admit that part of what I love about the park is all the amazing colors in the rock and water formations. I guess you’d just have to visit to see for yourself, back in 1890! I also like the black and white photos: do they date to the late 19th century or are they of more recent vintage? In getting to Yellowstone from Southern California, was it really necessary to go all the way up to Montana? I think I’ll pass on the arsenic-containing water. I took the photos within the last year and converted to black and white for this post. Yellowstone might very well be my second big trip behind the Northern Great Lakes. I too really like some of the natural beauty on display in both areas. Your post is a great reminder. 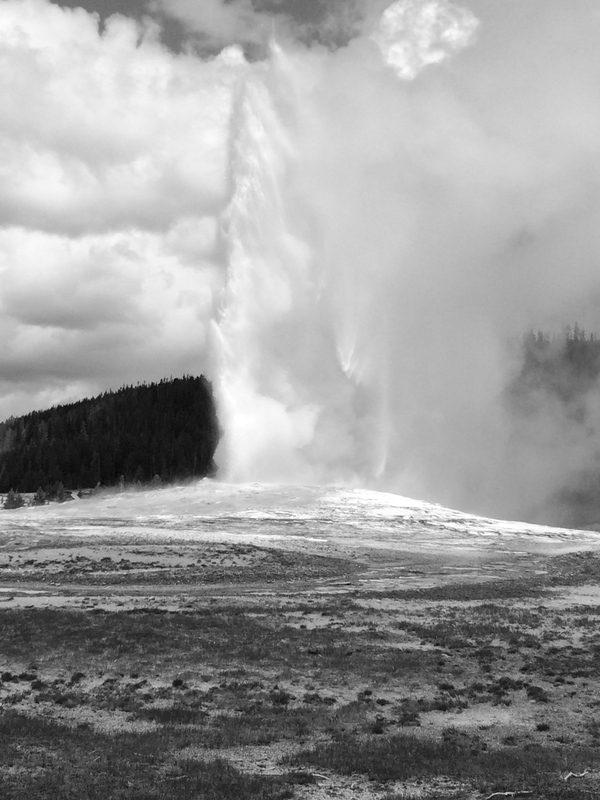 Wonderful place (I’ve been there) and wonderful blog of Yellowstone National Park! The animals must love the place too. Fabulous photos, together with your sparkling prose, I felt like I was right there! Wouldn’t it be a thrill to experience it like the pioneers did? So smart of the Park to make that possible. As if there wasn’t enough to make it an unforgettable experience! Can you imagine seeing this back in the 1890’s. It had very little roads with man’s influence limited on it. Not so sure about the arsenic spring water. Never been to Yellowstone! But it looks like such a remarkable place. Love the black and white photos. Thanks for posting the pics, Ken, and for your informative post. I have never been to Yellowstone before. I need to add it to my bucket list. The three summers I spent working in Yellowstone have thoroughly acquainted with its many wonders… some of the best ones not accessible from roadside either. Just imagine being one of those early visitors. What a trek to get there. I’ve been reading the book Death in Yellowstone on and off for a couple of months now and it’s hard to imagine all of the geyser basins without their wooden boardwalks or all the signs that warn visitors not to feed animals and to stay on designated paths. We sometimes scoff at that, but as more and more people flood the parks, it’s more important than ever that visitors realize the wild is still wild. I lived in Red Lodge, MT for ten years–it’s the northeast entrance to Yellowstone Park. Journeys there were always precious and full of light–from Old Faithful to Lake Hotel. Thanks for the trip in time, Ken.